VLC is a rich media player with extensive media playing features and allow you to create fun experiences with it. If you like some video or want to view certain thing in detail you always use the feature, loop. You can loop whole video or section of video on the loop. Here we will see a step-by-step guide loop videos on VLC player. Step 1 Open the video you want to loop using VLC player. If you want to loop multiple video files add them to the playlist. Step 2 In order to loop the video Just go to the loop button and click on it. If you want to loop the multiple files, just toggle the button to either loop one or all and toggle till you reach your desired result. These two-steps will make sure that your videos are in loop until you stop them. You must know that button has few different options toggle between no loop, loop one, and loop all. You can always add more file in the playlist. Step 1 Open the VLC media player and open the file or files you want to loop. Go to media menu and go to open file. Step 2 In order to loop the file in the playlist, from the bottom just toggle the loop button. Click on it once to loop one and loop again to loop all. You can click again to turn off the toggle. It all depends on how you want to play the videos. These are simple steps that you can follow to loop videos or various video files. You can always add more files in playlist. While creating or editing videos you may want to see the specific section for the video. With VLC, specific section can be easily looped with simple button. Here are the steps you can follow to loop specific section. Step 1 Launch video using VLC on your system. 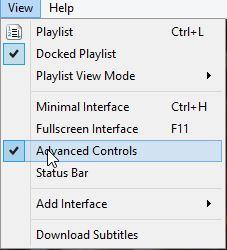 Go to view tab first and under tools click on Advanced Controls. Step 2 You will see few new buttons appear at the bottom. Now in order to loop the specific section. First, more the video to the starting point of the loop section and the click on the specific loop button. Step 3 Now to finish the loop, take the video to the end point and click on the same button again. You will see the two points of the button are red. Now play the video and the section will be looped. The method is same for both Mac and Windows operating systems.